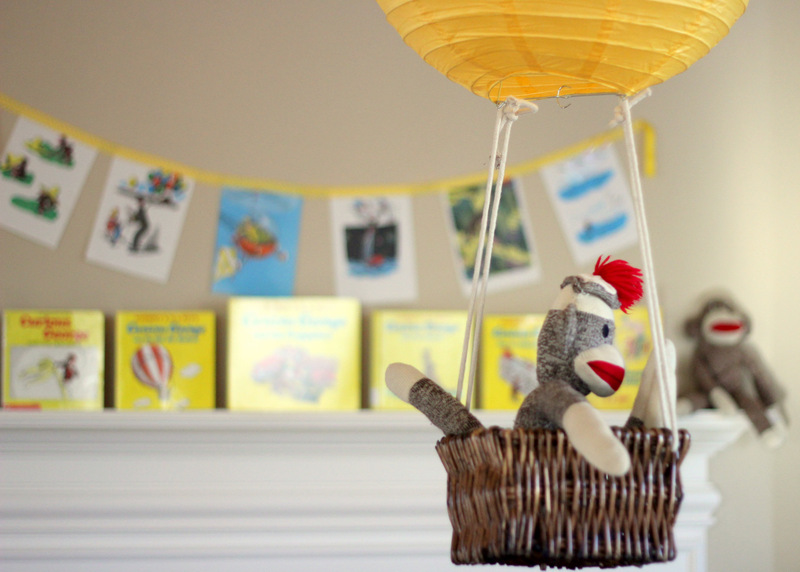 Interestingly, we seem to have quite the thing for Curious George around here (if you remember, Piper Jane and Burke were George and the Man with the Yellow Hat for Halloween). That’s funny because every time I read Curious George I feel like he’s so naughty and not adequately reprimanded for his naughtiness- haha. 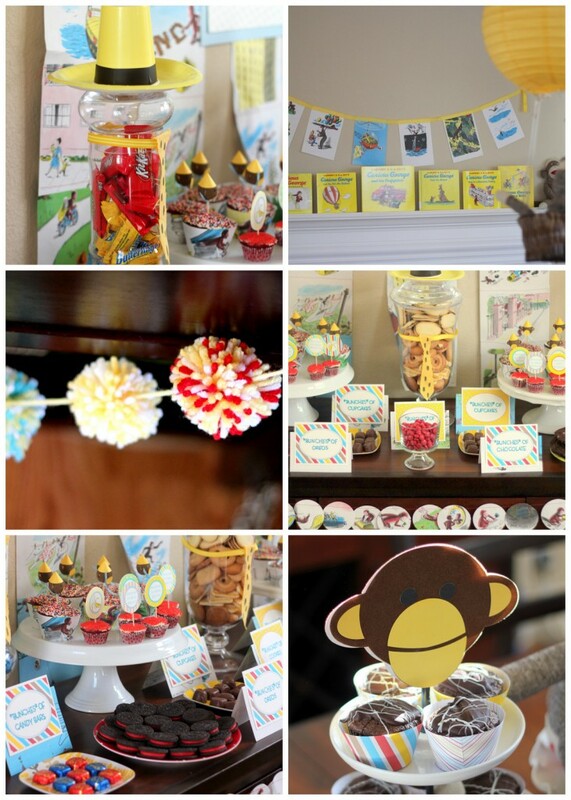 Regardless of the untamed naughtiness, Curious George is a super fun shower (or party) theme! 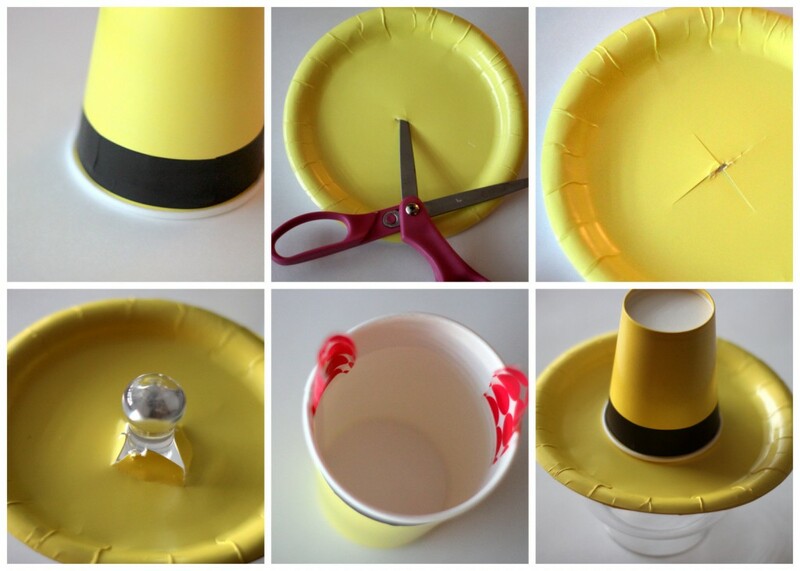 To make the Yellow Hat Toppers– Wrap a yellow cup with electrical tape or brown vinyl (we couldn’t find any electrical tape). I had to make several slits for it to sit right. Cut an “x” in the middle of a yellow plate. Tape the cup in place over the “x” using packing tape (put a little on the inside of each side of the cup). Slide the top of your apothecary jar or cake dome through the “x” cut. 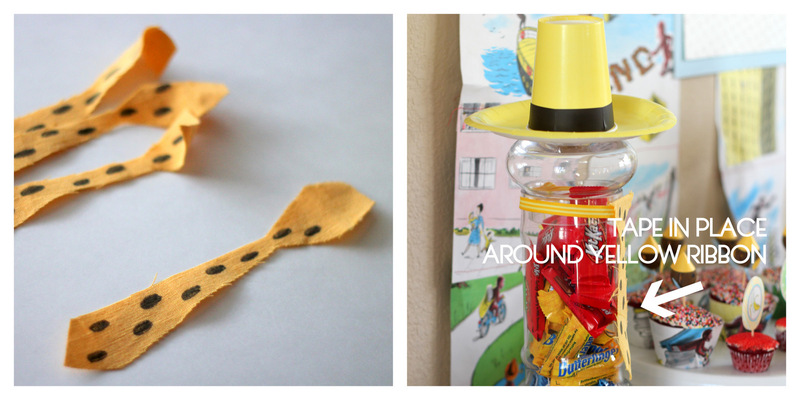 To make the Man with the Yellow Hat Ties– Cut a skinny tie shape from yellow fabric. Leave a tab of fabric at the top (you’ll need it in a minute). Draw little black ovals on the tie with a Sharpie. Tape the extra tab down around a length of ribbon. Use the ribbon to adhere to your jar (I also taped the tie itself to the jar just to ensure it’d stay put). To make the Book Page Cupcake Toppers– Print out a cupcake topper to use as a template (do a google search to find one). Trace it onto the book page (I tried to position it onto a space that included Curious George and some other fun illustrations instead of over the text). Cut out the wrapper and tape together. Use to accent a perfectly yummy red velvet cupcake (made healthier with Dana’s trick, sprinkled using this perfect sprinkles technique). 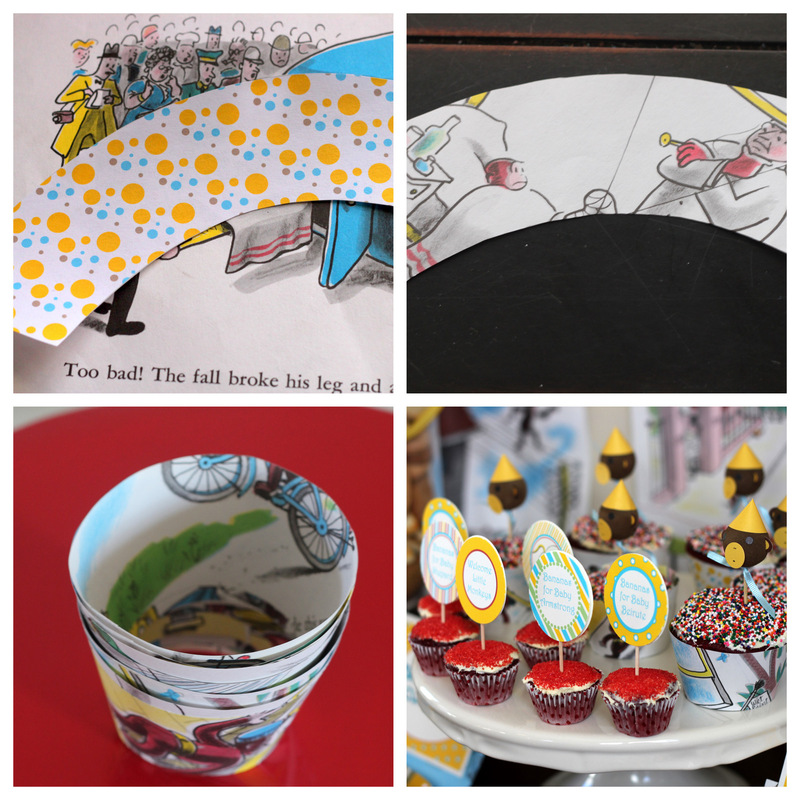 Circus boy party pack – these are awesome! 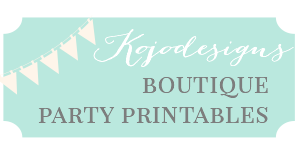 I would LOVE the Kite and Elephant Party Package – my husband’s birthday will take place soon, and since we are basically poor and only get access to internet downloads, printing a couple of nice things for his party would be perfect – and we both love elephants! i know this is kind of jumping the gun, but i LOVE the christmas green & red ornaments party package. i have been looking for an excuse for a cookie exchange and/or wrapping party and this might seal the deal for me. I would choose the boy sports birthday pack. I would have another child if it meant using all these ideas for a Curious George birthday party. Ok, maybe not that far, but soooo cute, anyways! I would choose the purple princess girl party. I love the design! I’d choose the Rapunzel pack! Perfect for my daughter’s birthday this summer! I would love the elephant baby shower pack if it comes in pink and grey please! I’ve got a girly baby shower coming up so I would totally do the elephant shower. Could it be made in pink? I love thr circus pack for a boy’s birthday. We are thinking of doing that as a theme for my son’s birthday since the circus will be in town the week of his birthday! I would choose the Rapunzel set!